And here is my card! I decided to go a little different way today!! It seemed too easy to do something flowery with Poppy Parade as the primary color, so I decided to go masculine. I looked at Plane & Simple, them remembered I had this new stamp, Extreme Guitar. Thank you SAB! Note to self: order the Extreme Elements to go with it!! I had to "make do" for the background because I couldn't come up with any elements that didn't look super feminine! Ok, from the top! The card base is Early Espresso with a Poppy Parade layer behind Crumb Cake. On the Crumb Cake, I first pulled out my Oval craft frame and used the center to make a mask. I placed that in the center of the card to keep it clean. Then I grabbed my Wonderfully Worn background and inked it first in Crumb Cake. I stamped it twice, flipping top to bottom in between. Then I inked it with Early Espresso and stamped it across the center. I filled in the edges on both end. Next I grabbed the Color Spritzer and the Poppy Parade marker and spritzed away!! Now, remove the mask and grab the Square Lattice folder. Put your card stock in the folder. Place the folder over the Craft frame so that the "clean" oval matches up with the oval on the frame. Run through the Big Shot. The edges of the Crumb Cake are sponged with Early Espresso. 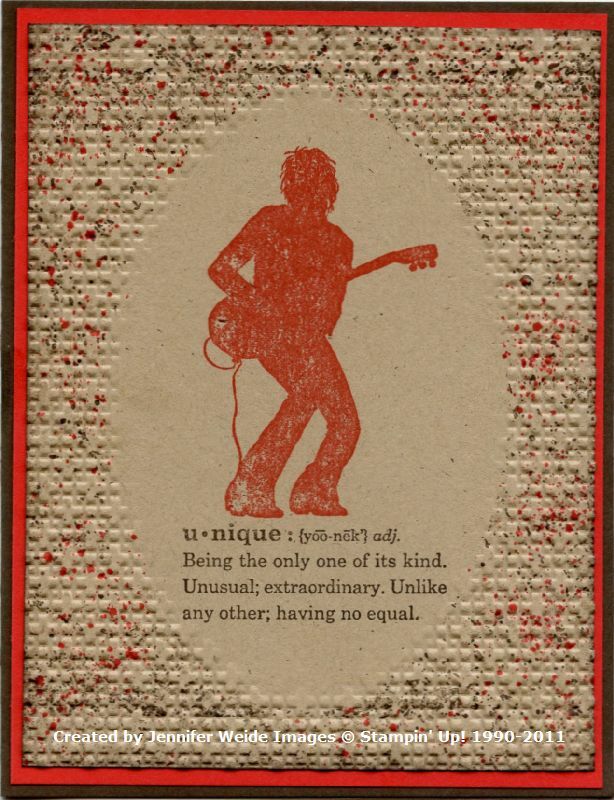 I stamped the Guitarist image in Poppy Parade and the "unique" definition from Define Your Life in Early Espresso. Seems like this would be a great encouragement card for teenagers?? Thanks for stopping by today!! Do stop over at the ColorLab to see what the other girls came up with and play along while you're there!! 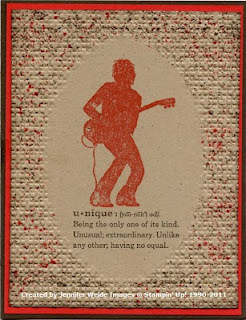 Great masculine card. My boys would enjoy getting one like that as they like to play Rock Band. I love your card. Can definitely be used as a masculine one. I'm sure my boys would like to receive a card like this since they like to play Rock Band. That masking technique is really neat. I love how you've spritzed it all over! I love the background you created. This is fantastic! Love the oval, love this stamp set with these colors! !